Winter is a trial by mud for me and Winter sogginess is lethal for many subtropical plants too. But in the depths of Winter a subtropical garden need not look as bleak as the weather feels. As I write this in a thrashing Winter storm, I'm cheered up by an unexpectedly tropical sight at the front step where, despite the awful clay soil and hideous weather, a defiantly glamorous Philodendron with red and green leaves climbs a Dracaena, holding on with twining aerial roots. I’ve realised that Philodendrons are one family of plants that can really look great through the wettest of Winters. They are mostly vines from South America, part of the taro family with handsome, waxy big leaves. For generations they have been used as house-plants but I am surprised at their extraordinary survival ability outdoors as long as they don’t get a direct frost. My front-door specimen is Philodendron imbe, I think or is it P. hastatum rubra? There are so many hybrids around these days that its hard to identify them for sure. This one’s rich red stems and the arrow-head shaped leaves with red on the undersides make it a handsome highlight among the greens of palms and other foliages. All the Philodendrons send out long aerial roots all the way up their stems which not only hold onto their support-tree, but also gather nutrients from the soil when they reach it. So the vine can survive almost entirely above the soil if it needs to during waterlogged times. 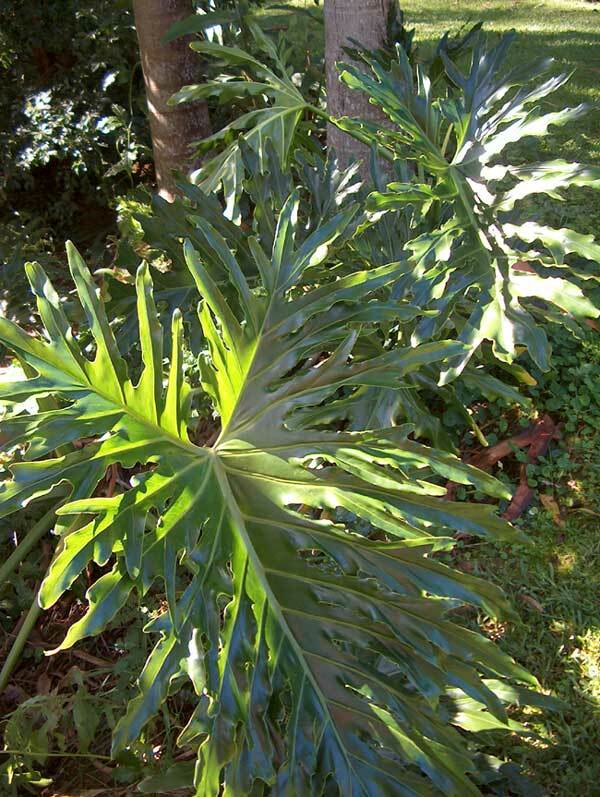 A familiar species is Philodendron selloum (now considered to be Philodendron bipinnatifidum)which can grow huge many-fingered leaves in sun or shade with eventually, an upright, stubby trunk. It is tough in the wind and even light frost, and makes a superb filler under a deck or big trees. The same can be said of another familiar member of the Philodendron family, the fruit-salad plant, Monstera deliciosa. This one can get a bit scary when it starts to romp across the lawn or climb the house, so stand by with the slasher! But it looks superb in the right place, such as planted as a massive groundcover under old totara trees where nothing else will grow. 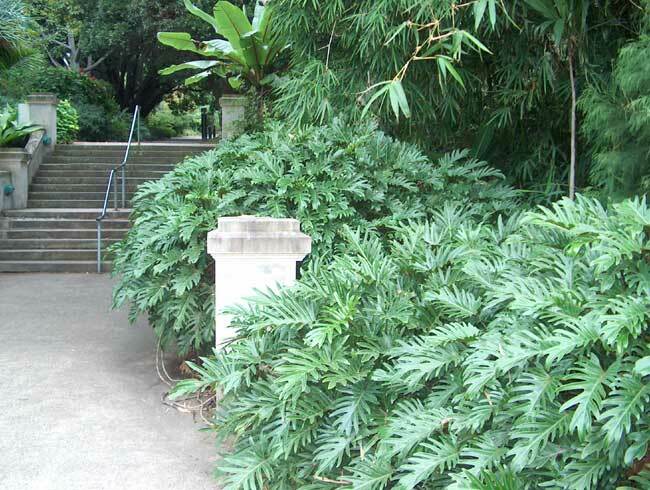 These can be planted by simply laying a piece of Monstera stem on the ground partly covered by soil. Within a few months the new leaves shoot away and eventually form a one metre deep ground-cover that looks lush and tropical all the time. It’s amazingly fragrant fruit taste like very rich fruit salad as long as you remove the little black speck at the end of each hexagonal segment. The black bit causes a prickly unpleasant sensation if eaten, but is easily removed. 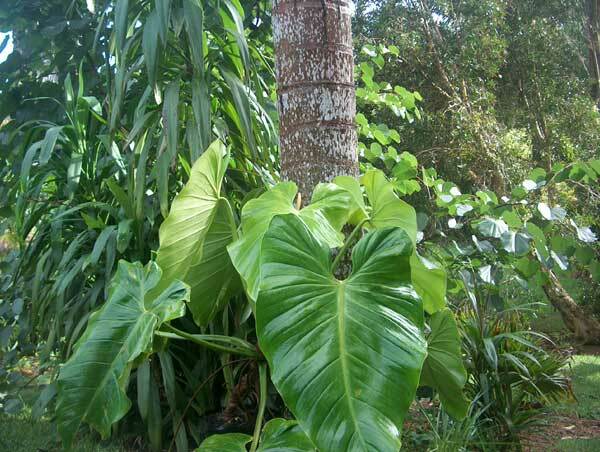 Philodendrons, like all the taro family are poisonous except for their ripe fruit. (Taro must be cooked properly to remove the throat-prickling toxins). Speaking of Monstera, there is a dainty little species available here called Monstera adansonii which climbs rapidly, wrapping its lush layers of perforated leaves round the trunks of trees or trellis. A delightful tropical accent in dappled light but it needs consistently warm conditions. Philodendron giganteum is yet another beautiful climber with big shiny heart-shaped leaves and will climb a palm tree slowly in our climate but will withstand extremely poor Winter soils with impunity. A little more temperamental is the exquisite little Philodendron “Xanadu”. This one forms a rounded clump, not usually a vine in NZ conditions. They need warm roots to handle our Winters and will thrive in tubs and raised stone or masonry garden beds but can easily die in wet cold soil. 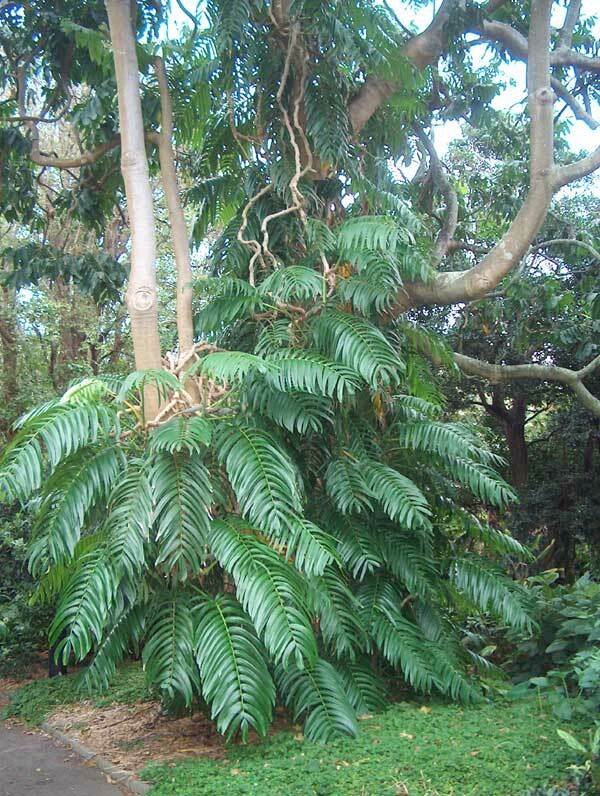 An interesting newcomer to NZ is Raphidophora decursiva, an Asian relative of the Philodendron clan. It is a vine like a very slender fruit salad plant that will climb trees, wrapping its roots round trunks for support, but relatively slow-growing here and easy to control. It can also make a handsome groundcover under trees. As with any subtropical plants, Philodendrons need to be planted as the soil warms up from August onwards but once established are, in most cases, tough garden tenants for Winter’s hard times and like all good tenants, they pay their rent all year long.